Not content to be another mild, treacly comedy about the perils of parenthood and acceptance (à la Mark Wahlberg’s Daddy’s Home pictures), the foster-care epic Instant Family is a surprisingly foul-mouthed, filled-to-bursting roller coaster of a comedy-melodrama that tosses you in eight different directions before leaving you a teary, conflicted mess. And when it works, it’s genuinely funny and moving. But when it doesn’t, hoo boy, it’s atrocious. But it mostly works. I think. Maybe. If, like me, you’ve seen the trailer approximately 8,643 times, then the plot won’t need much description, but here goes anyway: House flippers Pete and Elinor Wagner (Mark Wahlberg and Rose Byrne) begin to consider a foster child after belatedly deciding they’d like to start a family. Pete doesn’t want to be an old dad, so the notion of adopting a 5-year-old appeals to him. (“It’d be like I got cracking when I was 36,” he enthuses.) They become committed to the idea after Elinor spends an entire night looking online at touching pictures of kids looking for parents. The photos float helpfully across the movie screen alongside the children’s simple wishes. (“I’d be okay with any parents that listened,” “I need a mommy and daddy who will keep me safe,” etc.) Soon enough, they’re taking an eight-week foster-parenting course — taught by an uptight, by-the-book Tig Notaro and a remorselessly honest, no-holds-barred Octavia Spencer, who make for a good comic pairing — and eventually find themselves drawn to a sassy, confident, funny teen girl, Lizzy (Isabela Moner). But she comes with two younger siblings, Lita and Juan. Luckily, they’re adorable. The kids, needless to say, have challenges: Lita only eats potato chips and shrieks if given anything else; Juan is absentminded and klutzy, but also often overtly apologetic and vulnerable, physically shrinking from any attempts to console. (The movie doesn’t get into it, but it seems that he might have a history of abuse.) Lizzy, meanwhile, comes with the usual hang-ups of a rebellious teen, as well as the hang-ups of someone who’s been in the system her whole life, not to mention the hang-ups of someone who’s had to parent her siblings and now must watch someone else do it. Her story is, of course, the most interesting — her emotional trajectory is where the foster-care narrative really comes into play, and Moner is quite effective in the part. Director Sean Anders (who also helmed the Daddy’s Home pictures, as well as the Adam Sandler masterpiece That’s My Boy) based the story on his own family’s experiences fostering and adopting some siblings, and you can sense the film’s sincerity. We’re regularly plied with statistics and details about the challenges of kids in foster care: how many of them get stuck in the system permanently, how many wind up on the streets. Juan arrives with a giant bag of teddy bears, which seems like a character bit until we learn that he gets a bear every time he goes to family court. The other attendees at the parenting course are a cross section of Americans highlighting the diversity of these kinds of families: There’s the gay couple; there’s the super-religious couple; there’s the couple who has been unable to conceive; there’s the single woman who hopes to raise a professional athlete, which opens the way for some on-point Blind Side jokes. Indeed, the film seems hyperaware of the cultural currents and countercurrents swirling around adoption and privilege. At a couple of points, when they’re having second thoughts about the whole thing, Elinor asks if not going through with it would make them the worst people in the world. There’s a lot here about the raw way that these kids’ circumstances pull on your conscience. “I don’t want to see those faces! Don’t show me that!” Pete says early on, when he sees all the heart-tugging pictures of foster kids online. “Why would you show us that?” he exclaims later, when presented with pictures of the sweet-faced Lita and Juan, right as he and Elinor are about to reject the idea of taking in a trio of siblings. He wants to live in blissful ignorance, like so many of the rest of us. What makes Instant Family such a dissonant experience, however, is the awkward, blunt way that it mixes broad, shticky humor with earnest drama. That’s not unheard of with sentimental studio comedies, but here the swerves are sharper than usual, as if the film is desperate both to indulge and undercut the characters’ very real, very raw feelings. So much so that the obligatory emotional climax at the end — the usual one with the big earnest speeches and the tears and the family crises — is intercut repeatedly with a bizarre, out-of-left-field Joan Cusack cameo that seems expressly designed to undermine an otherwise extremely serious moment. The whole sequence is so jarringly put together that I began to wonder if it might have been added later, with Cusack shooting her scene after production had wrapped. Frankly, much of the film feels that way, like it’s at war with itself. 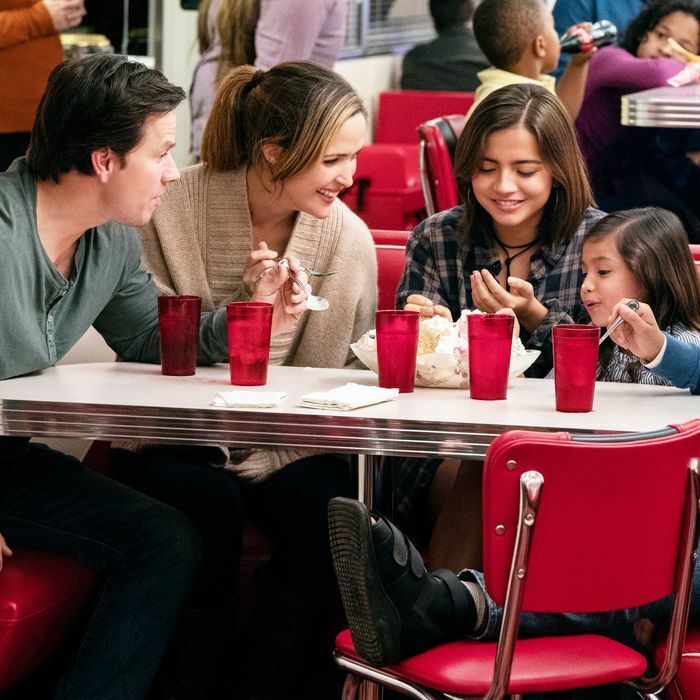 Instant Family stirs up powerful emotions, to be sure — I’d be lying if I said I didn’t cry a couple of times — but the movie sometimes seems afraid of what it wants to be. It is somehow both utterly heartfelt and utterly shameless. Don’t be surprised if it makes a trillion dollars.